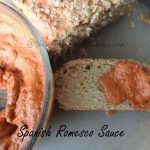 Romesco Sauce is a versatile sauce that goes well with sandwiches, pasta, grilled veggies, chicken, fish… you name it. The blogging world I meet many new bloggers and yes I get new inputs that I love to try. 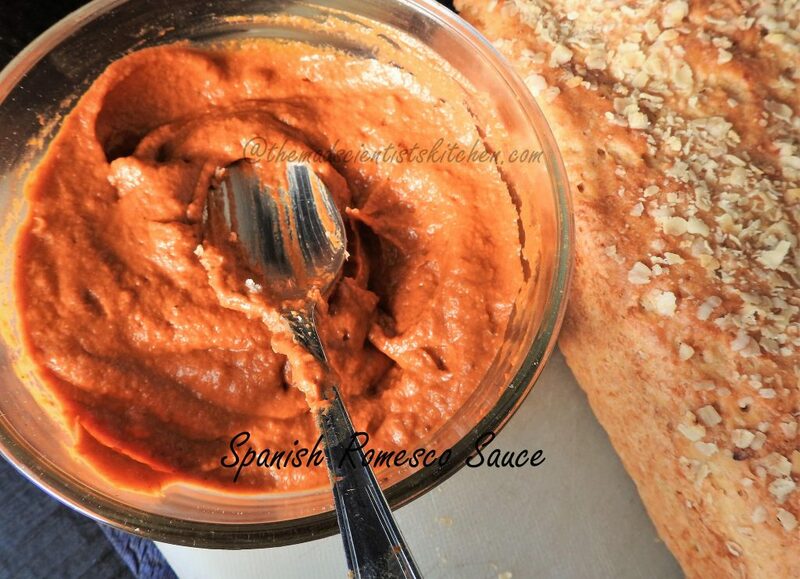 This Romesco Sauce I saw on Sujata place called PepperonPizza. I had to make it for Akanksha who goes to college at what feels like the crack of dawn. I can barely open my eyes and then getting in a conversation about her breakfast is impossible. Both of us do not want an argument first thing in the morning so I make chapatti for her. This sauce she will love to smear on it to eat. We had it on bread too. Preheat the oven to 200C / 400 F.
Slice the capsicum remove the stalk, seeds and membranes and the tomatoes. Brush the capsicum, tomatoes and garlic with a little olive oil. Transfer to a baking tray lined with parchment paper. Place the tomatoes with the sliced sides up. Bake for 20 minutes. Remove the garlic and set aside. Turn the slices and bake on the other side for another 20 minutes. Transfer the capsicum immediately to a bowl and let it sit covered for 15 minutes. In the hot oven put the almonds and the bread slices and let them toast for about 5 minutes. This can be done with the oven off too. After 15 minutes the capsicum and tomatoes will be easy to peel. Transfer immediately while hot to a flat surface (I used a flat chopping sheet) and cover with an inverted glass or metal bowl with no gaps underneath. The peppers will steam and the skin will begin to loosen. After about 15 minutes, you can easily peel the peppers and tomatoes. Crush the nuts, garlic bread, capsicum, tomatoes, parsley in the mixer. Add the chilli flakes, smoked paprika, salt and pepper and run the mixer. Add the vinegar and half the olive oil in a trickle while it the mixer is running. The consistency should be slightly runny. Check for seasoning then transfer to an airtight container and keep in the fridge till required. 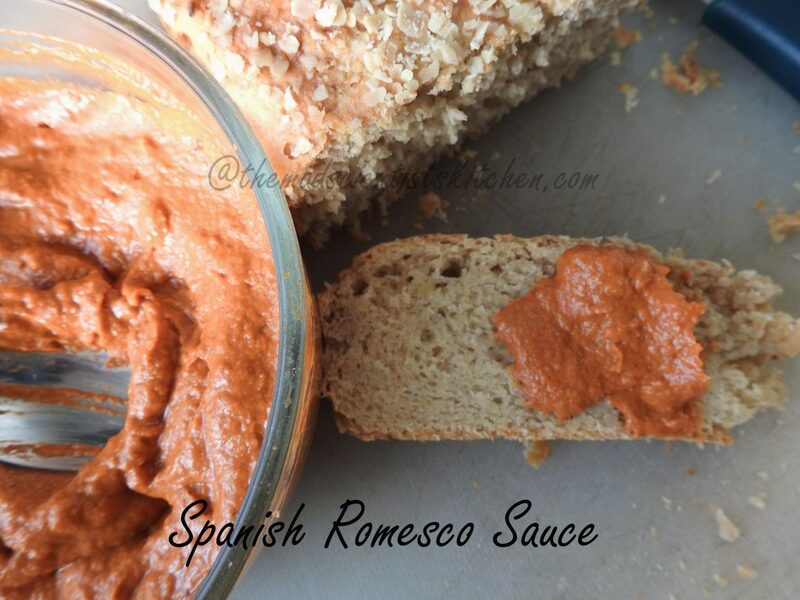 Spanish Romesco Sauce is a delicious sauce that you can eat with anything from bread to chapati to dosa and idli. Wow, how aromatic this sauce will be.. Prefect to relish with some baked chips. Drooling here. I was wondering why a sauce was doing in the Bakeathon, and then realized the base is baked… wow, so full of flavor this one would be! When I did the post I too was like…is it okay not okay but then since I baked it in the oven I went ahead. Thanks, Rafeeda. 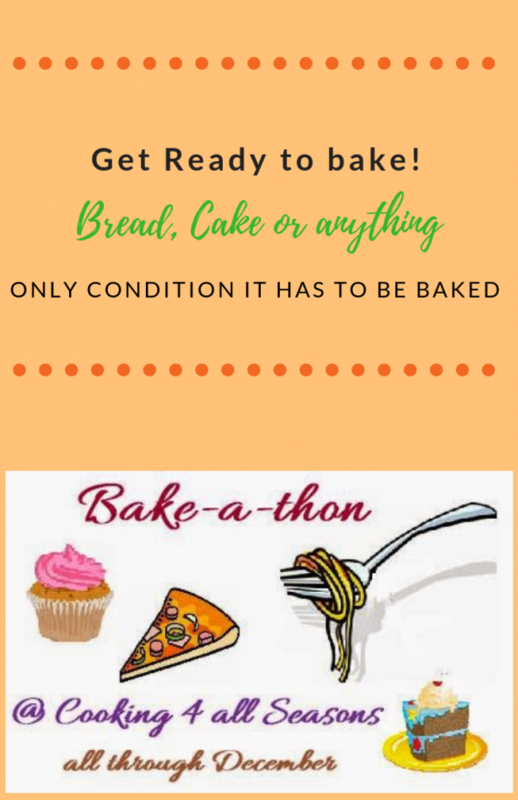 Even I was wondering a sauce in Bakeathon,after reading the entire post realized it’s a baked.Wonderful and flavorful recipe. Wow that’s looks so sinful! can imagine how creamy it must have tasted! Sauce in oven, that’s sounds so easy…would love it with some garlic bread. Red pepper is one of my favorite veggies – I love the sweet spicy flavor it has. 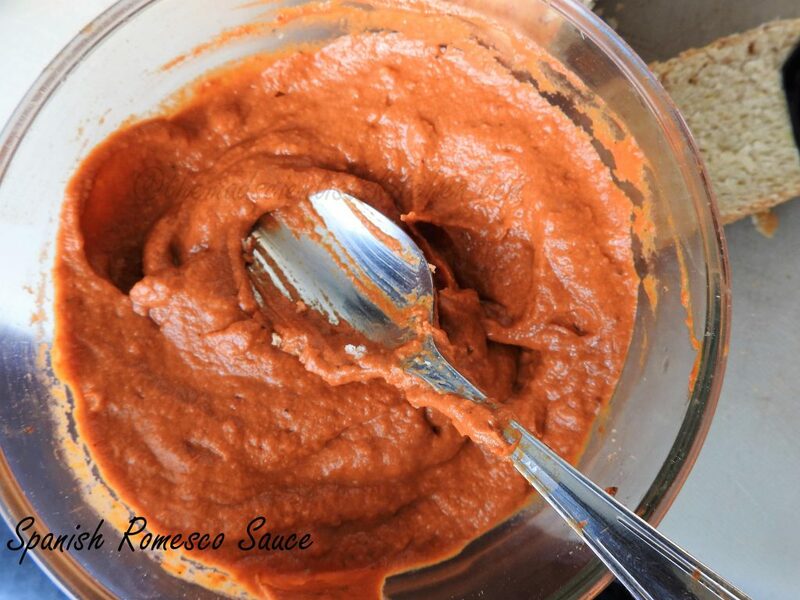 Roasting enhances the sweetness and must have made this Romesco sauce taste amazing. Perfect for dipping or spreading. Well, then we are 2 of the kind Pavani. Even I love red pepper any day. This recipe is so unique! All the ingredients are baked! Thanks for sharing, learnt something new. Rey interesting Archana , who would think of a sauce in a baking marathon ? Yes ! Only the mad scientist :)) great share and a flavourful sauce . Wow that looks so yum , tasty and flavourful. Would love to have this with a slice of bread. This is one flavourful sauce, very nice share! !Love to have with some toasted bread or chips!! This sauce is an interesting addition to the bakeathon entries. The sauce looks colorful and must be a flavorful one. You will love it Ritu. Wow, what an aromatic sauce arch! I bet these taste delish with everything! We would relish this sauce!Bookmarking this ! Let me know Priya when you make it.